The knife! It attacked me! Doctor! Long story short: I'm a victim of knife crime. I was just stood there (in my kitchen) helpless (making a salad) when all of a sudden, suddenly, with suddenness, a flash of silver same at me like a Bruce Lee movie without the 'heeuuyaaaaa'. There were vegetables and a pineapple involved but rest assured that the authorities are on the lookout of 'hoody' covered youths, most likely with a limp, low riding pants and a London-cockney accent, carrying pointy things. ASBO alert. 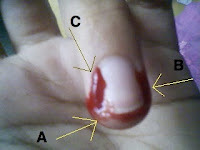 A: This is where the knife hit at a jaunty angle, causing the tip of my finger to slice off. We have found and stapled the fingertip back on. B: 'Twas a deep cut. 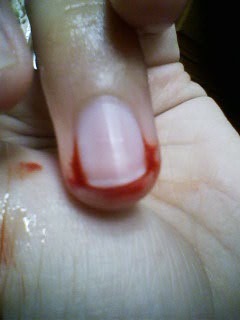 My finger went numb. I was in need of a doctor. It hurts. Next week: Why eating chicken wraps, Skittles and 4 dozen marshmallows in your mother's car with the windows down at 10pm listening to The Weepies and Massive Attack at full volume, driving without destination and using the phrase 'you holy fleurking schnit' at every other driver is not what your mother meant when she said, 'here, get some air inshaAllah, take the car, take your friends, be back before 6'. OMG! I laughed out so loud, multiple times reading your post. You are really a Riot! Get well soon.